On Wednesday, Abhay Deol mocked various B-Town celebs for endorsing fairness products. Now Sonam Kapoor has also jumped onto Abhay Deol’s battle against racist advertisements. 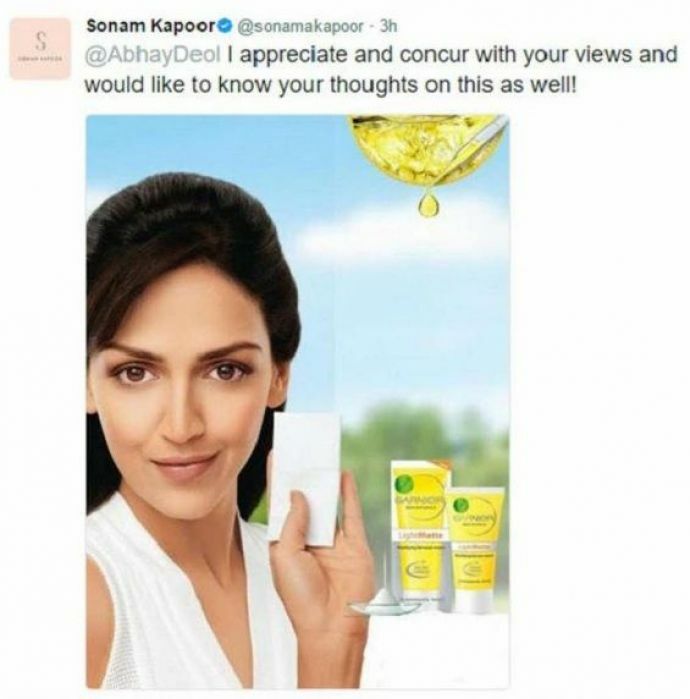 After Abhay Deol’s series of posts on his Facebook page where he named and slammed Indian actors for endorsing fairness creams, Sonam Kapoor also made a comment in response by tweeting a photo of Esha Deol, Abhay’s cousin, promoting a skin-whitening product and asked Abhay his opinion on it. After this rather embarrassing exchange, Sonam deleted all the tweets regarding the issue.